Pragmatism, defined by John Dewey, is a view that rejected the dualistic epistemology and metaphysics of modern philosophy in favor of a naturalistic approach that viewed knowledge as arising from an active adaptation of the human organism to its environment. Michelle Garcia Winner emphasized Dewey’s pragmatic theory into social intervention by saying that cognition by social aspect is generally an intuitive process that allow children in the spectrum to consider the points of view, emotions, and intentions of others. 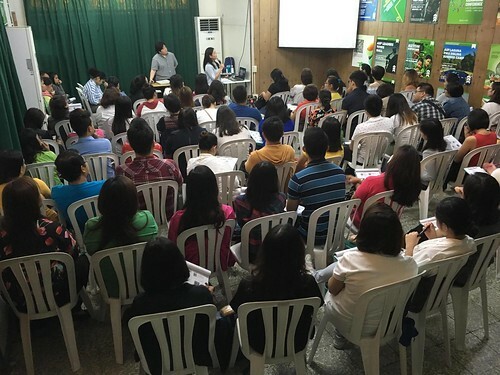 Kimberly Lim Geronimo and Elinor Bautista, speech and language pathologists, were speakers for the seminar conducted last 21 October 2017 at the ASP National Headquarters. They welcomed 87 participants. There, the goals were focused on the broader comprehension of the nature of pragmatics through the methodologies based on Winner’s propositions and assessments in social intervention. The former elaborated the social thinking treatment methodology by her conceptual definitions explained in the abstract schemes while the latter differentiated expected and unexpected behavior by citing examples of certain scenarios, as well as the principles stated by rules. They elaborated the strategies for resolving pragmatic disorders involving visual perception, body language and facial expression, social language development, physical proximity and eye contacts, vocal intensity and prosody, conversational approaches, perspective taking, and reaction and overreaction. They also clarified these by stating that when the pragmatic disorders became too inappropriate in the society, the children tend to cause exaggerations, provoking the thoughts induced in their thinking. The latter manifested her ideas when she fully generalized the social language development scenes by enhancing her schema on some situations while the former spontaneously elucidated the scenario to how language-based development and social interactions interconnect. About the contributor: John Christian Ambion has been diagnosed with autism since his childhood years. He finished at World Citi Colleges – Antipolo with the degree of Bachelor of Elementary Education and he plans to take the Licensure Examination for Teachers. He now works as an Assistant Teacher at St. Catherine Special Learning Center of Antipolo, Inc., his alma mater for eight years.